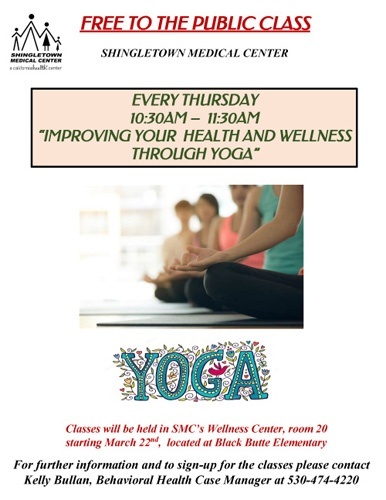 The Shingletown Medical Center is offering free Yoga and Walking classes to the public one day a week. 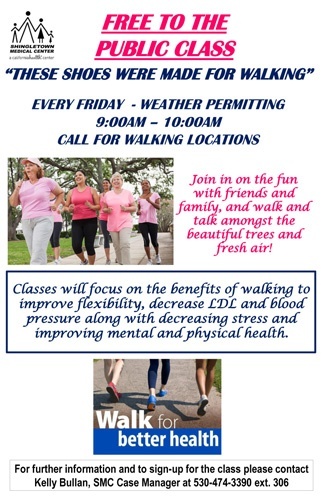 Please be sure to sign up for the classes in advance by calling Kelly at (530) 474-4220. Please read the flyers below for more details. please contact Kelly at (530) 474-4220. Kelly Bullan is a Behavioral Health Case Manager for the Shingletown Medical Center. Note: The Shingletown Medical Center also has a Fitness Center in Shingletown.